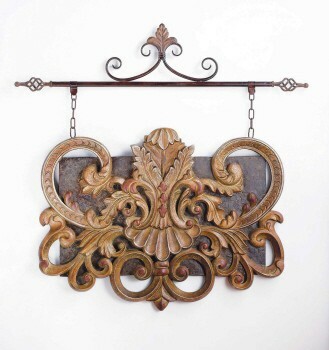 Uniquely rugged wall decor with scrolling Acanthus leaf design. Fleur de Lis emblem on top of finial rod and chain. Finished in Tuscan rust color with flowing leaf pattern. Made of polystone and iron. Measurements- 27.75 H x 1.5 D x 19.75 L.